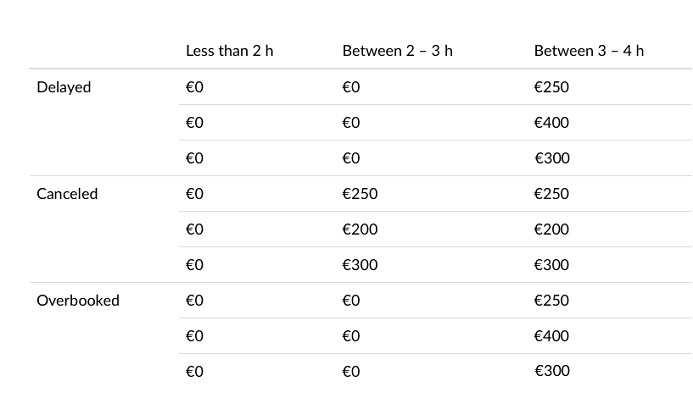 Each passenger can receive between € 250-600, depending on the distance to the destination and the length of delay. See the different timing requirements in the table below. The compensation is due immediately and irrespective of any re-routing offered. ** The compensation may be halved by the airline in case the delay, after offered and accepted re-routing, was less than 2, 3 or 4 hours depending on the length of the flight. Remember that the compensation is per passenger given that you had your own reserved seat (e.g. infants under the age of 2 are not entitled to compensation).